use on employee well-being. In this presentation, a model is proposed to evaluate how the concomitant advantages and challenges of robot technology use explain the relationship with employee wellbeing, considering different occupational groups and job levels. 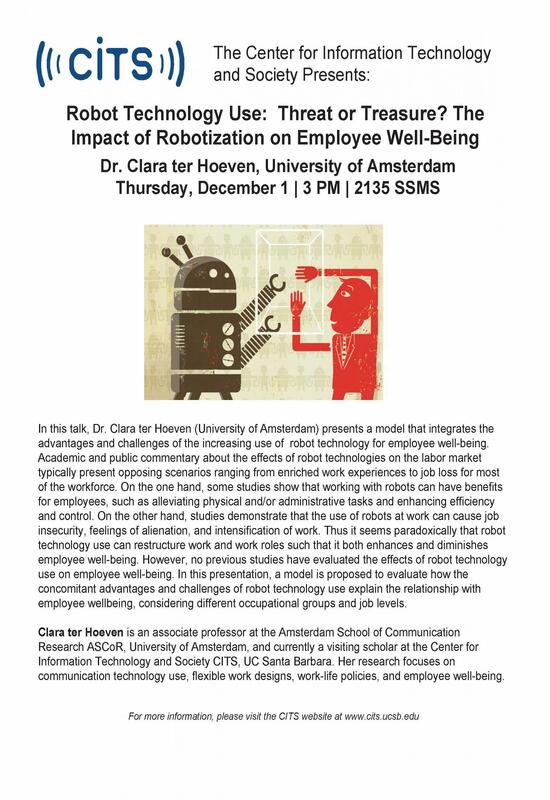 Clara ter Hoeven is an associate professor at the Amsterdam School of Communication Research ASCoR, University of Amsterdam, and currently a visiting scholar at the Center for Information Technology and Society CITS, UC Santa Barbara. Her research focuses on communication technology use, flexible work designs, work-life policies, and employee well-being.